The Houston Cougars men's basketball team represents the University of Houston in Houston, Texas, in the NCAA Division I men's basketball competition. The university is a member of the American Athletic Conference. The team last played in the NCAA Division I Men's Basketball Tournament in 2018 and is tied for 15th in number of Final Four appearances. Although the University of Houston already had a women's basketball program, the Houston Cougars men's basketball program did not begin until the 1945–46 season. Alden Pasche was the team's first head coach. In their first two seasons, the Cougars won Lone Star Conference regular-season titles and qualified for postseason play in the NAIA Men's Basketball tournaments in 1946 and 1947. The Cougars had an all-time NAIA tournament record of 2–2 in two years. During Pasche's tenure, the Cougars posted a 135–116 record. Under his leadership in 1949, the Cougars won the Gulf Coast Conference championship. College Basketball Hall of famer coach Guy V. Lewis played for Pasche, and eventually became an assistant coach before being handed the job upon Pasche's retirement. Pasche retired after the 1955–56 season, and Houston assistant Guy Lewis was promoted to the head coaching position. 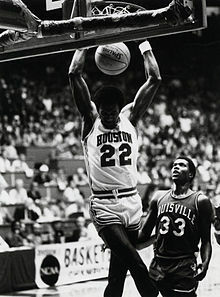 Lewis, a former Cougar player, led Houston to 27 straight winning seasons and 14 seasons with 20 or more wins, including 14 trips to the NCAA Tournament. His Houston teams made the Final Four on five occasions (1967, 1968, 1982–84) and twice advanced to the NCAA Championship Game (1983, 1984). Among the outstanding players who Lewis coached are Elvin Hayes, Hakeem Olajuwon, Clyde Drexler, Otis Birdsong, Dwight Jones, Don Chaney and "Sweet" Lou Dunbar. Lewis's UH teams twice played key roles in high-profile events that helped to popularize college basketball as a spectator sport. In 1968, his underdog, Elvin Hayes-led Cougars upset the undefeated and top-ranked UCLA Bruins in front of more than 50,000 fans at Houston’s Astrodome. 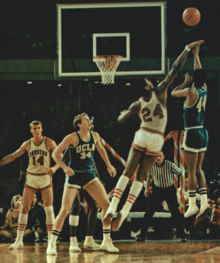 The game became known as the “Game of the Century” and marked a watershed in the popularity of college basketball. 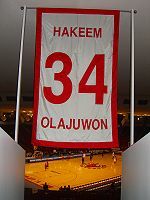 In the early 1980s, Lewis's Phi Slama Jama teams at UH gained notoriety for their fast-breaking, "above the rim" style of play as well as their overall success. These teams attracted great public interest with their entertaining style of play. At the height of Phi Slama Jama's notoriety, they suffered a dramatic, last-second loss in the 1983 NCAA Final that set a then-ratings record for college basketball broadcasts and became an iconic moment in the history of the sport. Lewis's insistence that these highly successful teams play an acrobatic, up-tempo brand of basketball that emphasized dunking brought this style of play to the fore and helped popularize it amongst younger players. 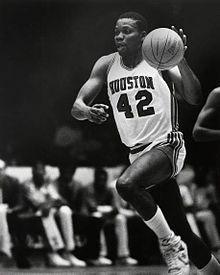 Houston lost in both NCAA Final games in which Lewis coached, despite his "Phi Slama Jama" teams featuring superstars Clyde Drexler and Hakeem Olajuwon. In 1983, Houston lost in a dramatic title game to the North Carolina State Wolfpack on a last-second dunk by Lorenzo Charles. The Cougars lost in the 1984 NCAA Final to the Georgetown Hoyas, led by Patrick Ewing. Lewis retired from coaching in 1986 at number 20 in all-time NCAA Division I victories, his 592–279 record giving him a .680 career winning percentage. As a coach, Lewis was known for championing the once-outlawed dunk, which he characterized as a "high percentage shot", and for clutching a brightly colored red-and-white polka dot towel on the bench during games. Lewis was a major force in the racial integration of college athletics in the South during the 1960s, being one of the first major college coaches in the region to actively recruit African-American athletes. His recruitment of Elvin Hayes and Don Chaney in 1964 ushered in an era of tremendous success in Cougar basketball. The dominant play of Hayes led the Cougars to two Final Fours and sent shock waves through Southern colleges that realized that they would have to begin recruiting black players if they wanted to compete with integrated teams. After 21 years in the Southwest Conference, the Cougars joined Conference USA in 1996. Under head coach Alvin Brooks, the basketball program had a disappointing initial season in C-USA. The team went 3–11 against C-USA teams in 1996–97. The next season was even more futile. Brooks, who had led the Cougars since 1993, coached the Cougars to a rock bottom conference record of 2–14 in 1997–98. The last, and only other, time the Cougars recorded only two conference victories in a season was in 1950–51; their first season in the Missouri Valley Conference. 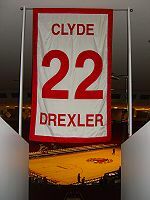 One of Houston's biggest sports icons and one of the Cougars best basketball players ever, Clyde Drexler was hired to coach the program that he led as a player to the 1983 NCAA Final as part of Phi Slama Jama. Basketball excitement was back on campus, and fans looked forward to the promising years to come. After just two seasons with minimal success, Drexler resigned as head coach citing his intention to spend more time with his family. Ray McCallum was hired to do what Clyde Drexler could not—lead the Cougars to a winning season and earn a spot in the NCAA Tournament. After losing seasons in each of his first two years, McCallum guided the Cougars to an 18–15 record in 2001–02. That season, the team won two conference tournament games and qualified for the National Invitation Tournament. However, the team regressed in the following season and failed to qualify for even their own C-USA tournament. Tom Penders was named as the head coach of Cougars basketball in 2004. Known as "Turnaround Tom" for his reputation of inheriting sub-par basketball programs and making them better, Penders was hired to rebuild a program that recorded only one winning season in its last eight years. After a surprising debut season in 2004–05 that led to an NIT appearance, the team had high hopes to build on their relative success and make the NCAA Tournament in 2006. The 2005–06 season looked promising at the outset. The Cougars started their first game on a 30–0 scoring run against the Florida Tech Panthers. Less than two weeks later, the Cougars beat the nationally ranked LSU Tigers on the road and the Arizona Wildcats at home. The surprising wins earned the Cougars their first national ranking in several years. The team that seemed destined for an NCAA Tournament berth failed to capitalize on their success and national recognition and began to stumble after a loss to South Alabama Jaguars in December. The Cougars won only one conference tournament game and had to settle again for another NIT bid. Dubbed as "The Show," the 2006–07 Cougars entered the season with cockiness and strong expectations to finally make it into the NCAA Tournament. A difficult schedule matched the Cougars with seven different teams that would end up qualifying for either the 2007 NCAA Tournament or NIT. Houston lost three times to the Memphis Tigers and once each to Arizona, the Creighton Bluejays, the Kentucky Wildcats, South Alabama, the UNLV Runnin' Rebels, and the VCU Rams. By going 0–9 against these quality teams, the Cougars proved they were not worthy of an at-large bid to the NCAA Tournament. Not surprisingly, two conference tournament wins against lower seeds and an unimpressive 18–15 overall record were not even enough to earn the team an invitation to the NIT. In 2007–08 the team introduced a new nickname ("The Show—In 3D") and a slightly new uniform (a changed trim design). The team hoped to reach the NCAA Tournament for the first time since 1992. Eight straight home games from November 21 to December 29 helped the Cougars get off to an 11–1 start. However, the team lost most of its critical games at the end of the season, including their last two games (both against the UTEP Miners). Houston received an invitation to the inaugural College Basketball Invitational tournament and defeated the Nevada Wolf Pack and the Valparaiso Crusaders but lost to their conference rival, the Tulsa Golden Hurricane, in the semifinal round. 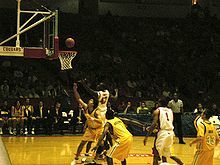 The 2008–09 season began on November 11 with a two-point loss to the Georgia Southern Eagles; this was the first game of the Division I college basketball season and the opening game of the 2K Sports Classic tournament in Durham, North Carolina. A Cougars win would have meant a second round matchup with the Duke Blue Devils. Overall, the Cougars played a balanced home and away regular season schedule. 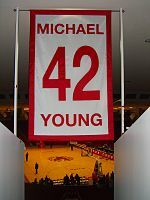 Fifteen games (three in November, three in December, four in January, three in February, and two in March) were played at Hofheinz Pavilion. There were fourteen away games (two in November, two in December, five in January, and five in February). The 2009–10 team finished the regular season 15–15 and 7–9 in C-USA, finishing seventh place in the conference. Following a 93–80 win over East Carolina in the first round of the C–USA Tournament, the Cougars beat Memphis 66–65, ending a string of four tournament titles for the Tigers. In the next game, they defeated Southern Miss 74–66 to advance to the championship game. Finally, the Cougars beat #25 ranked UTEP 81–73 to earn the conference's bid to the NCAA Tournament, their first since 1992. In the First Round of the NCAA Tournament, Houston, seeded 13th, was defeated 89–77 by 4th-seeded Maryland. Penders announced his resignation as Houston head coach on March 22, 2010. The school hired James Dickey on March 21, 2010. In four season with Houston, Dickey amassed a 64–62 record with no NCAA Tournament appearances. Beginning with the 2013–14 season, Houston joined the newly created American Athletic Conference following the Big East realignment. On March 2014, Dickey stepped down as head coach because of "private family matters". On April 3, 2014, Houston hired Kelvin Sampson as the new Cougars head coach. Sampson had just become eligible to be a college coach again after receiving a five-year show cause penalty in 2008 for sanctions against him during his time as Indiana head coach. In 2014–15, Houston struggled again, finishing with a 13–19 record and 4–14 in the AAC. The 2015–16 team led a resurgence, finishing 22–10, 12–6, but lost in the AAC Tournament and in the first round of the NIT. In 2017–18, the Cougars compiled a 27–8 record, reaching the finals of the AAC Tournament and winning a game in the NCAA Tournament for the first time since 1984. In 2018–19, the Cougars' success continued as they set a program record for wins with a 33–4 mark. They were AAC regular-season champions but fell in the finals of the conference tournament. They proceeded to the NCAA Tournament, where they reached the Sweet Sixteen for the first time in 35 years. The Cougars have appeared in 21 NCAA Tournaments. Their overall record is 29–26. The Cougars have appeared in eleven National Invitation Tournaments (NIT). Their combined record is 5–11. The Cougars have appeared in the College Basketball Invitational (CBI) three times. Their combined record is 3–3. The Cougars have appeared in the NAIA Tournament two times. Their combined record is 2–2. ^ "First UH basketball Coach Pasche dead". Houston Chronicle. 1985-05-10. Retrieved 2008-07-16. ^ "Ex-Tech coach James Dickey wins race for UH job". Houston Chronicle. Retrieved 2016-04-07. ^ "Cougars' Dickey resigns; Sampson in line?". ESPN.com. Retrieved 2016-04-07. ^ a b "UH reaches five-year deal with Kelvin Sampson". Houston Chronicle. Retrieved 2016-04-07. Wikimedia Commons has media related to Houston Cougars men's basketball.